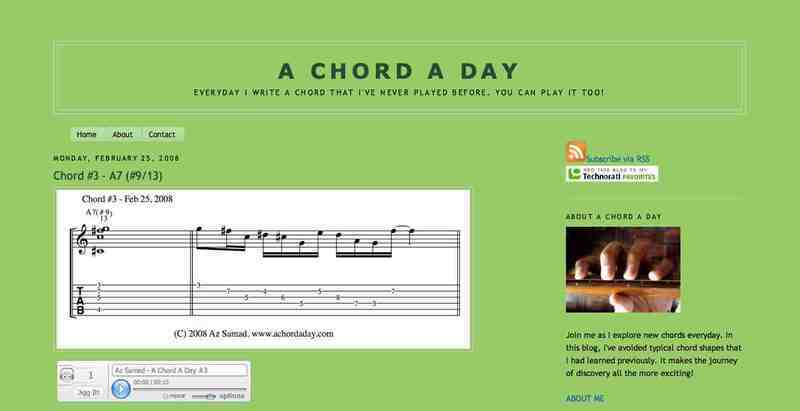 This might be a useful tool for you if you are interested in expanding your choices for chords when playing music. In this blog, I've avoided typical chord shapes that I had learned previously. Join me today in my chord adventures. Thanks for checking it out and feel free to let me know what you think! Sudah beberapa kali singgah, tapi kali ini baru berani memberi komen. Dulu saya tahu saudara anak sasterawan negara.Dan dulu saya terfikir nak bertanya; apa rasanya jadi anak Pak Samad? Sekarang - apa pula rasanya jadi komposer? *Saya kenal Az (tp Az tak kenal saya) di SK Ampang. Huhu, zaman kanak-kanak riang! It is extremely interesting for me to read the post. Thank author for it. I like such themes and anything connected to this matter. I definitely want to read a bit more on that blog soon. Great article you got here. It would be great to read a bit more about that topic. Thank you for giving this info.